117th day of the year. There are then 248 days left in 2019. 39th day of Spring. There are 56 days left till Summer. 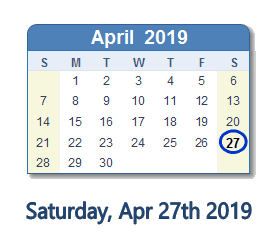 April 27, 2019 is the 8th and last day of Passover (Jewish Observance). What happened on April 27th 2019?